We've collaborated with Eurocircuits to manufacture this unique two-tone circuit board that transitions from blue to green. When The Gent's 'eye' (a phototransistor) is pointed towards a light the five LEDs are off. As soon as light is blocked from The Gent's view it gracefully shows its colours. 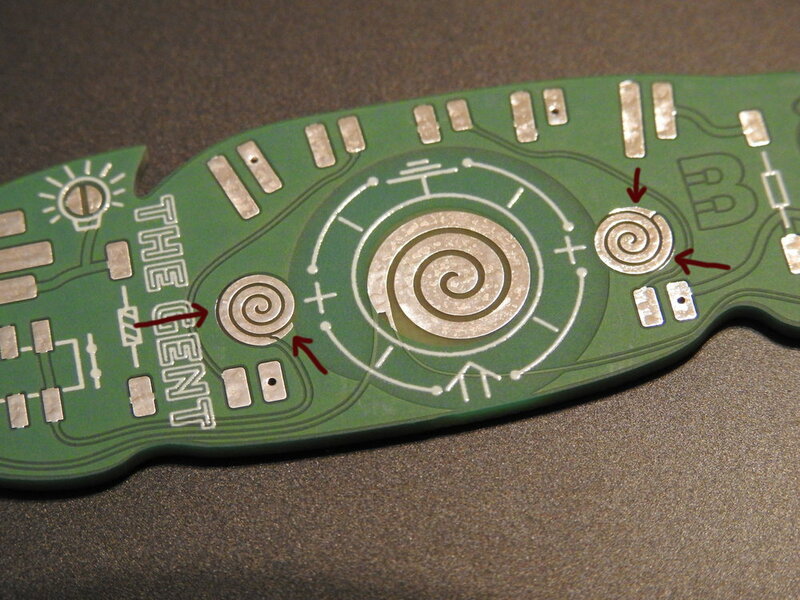 The Gent was project #10 of the Boldport Club. A phototransistor acts as a light detector; conducting when it 'sees' light. When there is light pointing at the phototransistor, the MOSFET is off, which means that the LEDs are also off. When there's darkness, the MOSFET's gate is pulled 'high' and turned on causing the five LEDs to turn on as well. Assembly of the kit is relatively straightforward using the assembly guide. Below are a few things to note. The 'legs' are a part of the circuit. Don't let the leads between the board and the resistors' bodies touch. There is a small amount of current flowing through the circuit even when the LEDs are off (about 300µA). We recommend that you switch off the circuit when it is not in use to avoid battery waste. Solder the battery holder last, as this makes soldering the other components easier. Also make sure that the battery holder's metal body doesn't touch any of the circuit contacts or components. The bits pointed by the arrows were meant to be covered. The battery holder may short the battery to the power plane, which will cause the switch to not function and the board to be always 'on'. Unfortunately, despite best efforts sometimes a circuit board doesn't come out perfect. Our The Gent has a fault: the battery holder's positive terminals may be shorted to the power plane through exposed copper around the two swirly side contacts of the holder. These are the bits that need not be shorted to the battery holder positive terminals. A good solution is to use a bit of Kapton tape to cover the exposed bits that are meant to be covered by soldermask and then solder the battery holder as normal. Perhaps more immediately practical is to cut the battery holder using strong wire cutters so that its positive terminals avoid the problematic areas and then carefully apply solder. One can also try to carefully cut out the unwanted exposed bits so that they are no longer connected to the power plane. Finally, one could simply eject the battery when the board is not in use.